The year isn’t even over, but it has already been an incredible one for tablet users all around the globe. A lot of companies debuted promising new hardware over the past few months, including budget-friendly Android tablets and stunning Chrome OS convertibles. Some of them might not exactly be affordable. However, if you’re patient enough, you might score great deals during the holidays. On the other hand, you don’t have to wait that long to replace your old tablet. If you need new tech for something basic like playing tablet games or streaming on Netflix, consider getting an Amazon Fire 7. Not only is it a great piece of hardware, but it’s also budget-friendly. The Fire 7 is currently on sale for $39.99. Amazon knocked $10 off its street price to offer techies one of the best deals, if not the best, for this tablet. The sale applies to all color variants of the Fire 7 tablet—Black, Canary Yellow, Punch Red, and Marine Blue. That’s not the only deal Amazon is offering today, either. They also lowered the price of the Fire 7 tablet’s Kids Edition. Now, anyone can get the device for $79.99, which is down from $99.99. Remember that these are limited-time offers. If you don’t want to miss out, place an order before the prices revert to normal. 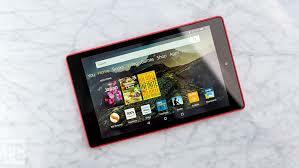 Amazon’s Fire 7 tablet comes with a 7-inch IPS display. It’s thinner compared to its predecessor. The 2017 model is 9.6 mm while the 2015 edition measures 10.6 mm. That also makes it thinner than the Fire HD 8 and thicker than the 7-inch Samsung Galaxy tablet by 0.9 mm. The Fire 7 is equipped with a 1.3 GHz quad-core processor, and it has 8 GB of storage space. That may not sound like much, but you can always expand its storage capacity with a micro SD card. A 32 GB SanDisk won’t even cost $10. In a single charge, the Fire 7 can last up to eight hours. The Fire 7 comes with Alexa support. Using your tablet, you can talk to Amazon’s virtual assistant and ask her questions. She can assist with your digital needs. With a single command, she can play your favorite song. She can check the weather or remind you of an upcoming meeting. The device offers its users access to the Amazon app store. From there, you can download all your favorite apps. You can access video streaming platforms like Netflix, HBO, and Hulu. You may also download social media apps such as Facebook and Instagram. Again, the Amazon Fire 7 deal is available for a limited time only, so place an order while you can. However, you don’t have to worry too much as there will be plenty of opportunities next month. The season of giving is right around the corner, which means companies are going to drop excellent deals in the next few weeks. Maybe it’s time to sell tablet units for an upgrade.